This fairly broad and nebulous definition gives the government flexibility in labeling nearly any dissident a terrorist. Throw a Molotov cocktail at a police car at an anti-globalization protest, and you might just become a terrorist in the eyes of the state. So it is with Assata Shakur, a former Black Panther and political dissident convicted in the murder of a police officer. The FBI recently placed Shakur on its Most Wanted Terrorist list. She is notably the first female to make the list of terrorists. For the mainstream media, that was really the beginning and end of the story. It’s great spectacle for site traffic, but those seeking real analysis were left wanting. Aside from a few sensible editorials–The Washington Post and NPR, for example–there was a failure to question the FBI’s move, or to ask the Obama administration to comment on Shakur’s new “terrorist” label. Before descending into the question of whether Shakur should be labeled a “terrorist,” it’s valuable to take a slight detour into the semiotics of “terrorism,” and to understand the introduction of the label into the everyday American lexicon. Terror, as a word and concept, is most often traced back to the “Reign of Terror” carried out by the French government in 1793, after the Revolution. It likely goes back even further, though, depending on one’s definition and perspective. The word really took root after the Jacobins, of which Maximilien Robespierre was a member, took over the French Convention and unleashed a proto-Stalinist purge of opponents. The explanation? To establish social order. Following Robespierre’s execution and the Jacobin downfall, “terrorist” became a pejorative leveled at Jacobins. This French definition dealt strictly with state terrorism. In the centuries since, terrorism has evolved into something kaleidoscopic and endlessly malleable. Current states may not be ushering their opponents, whether domestically or internationally, underneath the guillotine’s blade, but there certainly are other means of imposing terror on people and populations. (See: the US government’s support of the Contras’ bloody terrorism against the Sandinista government, or Stalin’s “Great Terror” campaign.) The governments of the twentieth and twenty-first centuries have become quite adept at the practice, though bristle at or ignore any suggestions that they themselves engage in terrorism. The word and the actions it signifies move in many directions — it should not be limited to religious or political dissidents who use violent spectacle to advance their agendas. Establishing when the word “terrorist” enters the American lexicon is difficult. Brigitte Nacos, Adjunct Professor at Columbia University’s Department of Political Science, provides some historical perspective on “terrorist” labeling post-French Revolution in her book Terrorism and Counterterrorism. 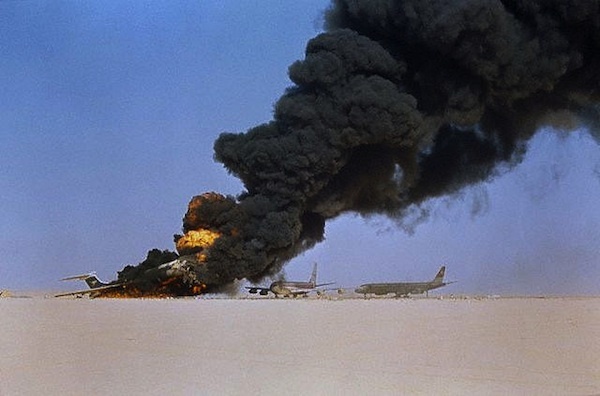 In 1970, Palestine Liberation Organization guerillas blew up four empty airplanes at Dawson’s Field in the Jordan desert. The planes were hijacked by the PLO during the preceding week; 200 passengers and crew were kept in custody in exchange for Arabs held in western jails. Its modern usage–the Islamic jihadist variety being the most common–seems to have come into being as a way of classifying those violently seeking Palestine’s “liberation,” such as the PLO. Other examples include the FLQ (Front de Liberation du Quebec) and the Basque ETA (Euskadi ta Askatasuna, or Freedom for the Basque Homeland). Terrorism in its current form, as a word and ideologically-motivated activity, was probably imprinted on the American and international psyche with airplane hijackings in the ’60s, ’70s and ’80s. The spectacle and mass media frenzy no doubt helped propagate the image of the terrorist. But, the definition has shifted so many times over the 20th and 21st centuries, that it becomes a monumental task to chart its evolution. Looking back at history, a number of events could retroactively be defined as “terrorist” acts; which, for America’s power elite, is the beauty of the word’s semiotic power. “What is called terrorism thus seems to depend on one’s point of view,” wrote Brian Jenkins in a 1980 paper for RAND called The Study of Terrorism: Definitional Problems. “Use of the term implies a moral judgement; and if one party can successfully attach the label terrorist to its opponent, then it has indirectly persuaded others to adopt its moral viewpoint.” Jenkins should have pivoted there to fully consider the propagandistic advantages of labeling an opponent a terrorist. And so we turn again to Assata Shakur. As a former Black Panther, no doubt Shakur was (and still is) politically dissident. She was also a member of the Black Liberation Army (BLA) and Republic of New Africa, an independent black nation mapped out in 1969, with citizens in Georgia, South Carolina, Louisiana, Alabama, Mississippi, and other southern states home to significant African-American populations. Her activities in the black power movement pushed her into various forms of activism. Shakur was suspected and tried for a number of crimes, many of which ended in acquittal or dismissal. The one that stuck, however, was the murder conviction in the New Jersey Turnpike Shootout in 1973, in which Shakur was present at the roadside murder of State Trooper Werner Foerster. Shakur didn’t fire a weapon at Foerster, and is said to have had her hands up when the shooting occurred. Nonetheless, she was convicted as an accomplice to murder. In 1979, Shakur escaped from prison, went underground for a few years, resurfacing in Cuba in 1984, where she was granted political asylum. She believes, and perhaps quite rightly, that because of politically-motivated government surveillance of her activities in the BLA, she didn’t receive a fair trial. Do the regrettably violent actions of her fellow BLA member, Sundiata Acoli, render Shakur a terrorist, simply because the BLA used violence in their open hostility to American government? They called what they did “revolution,” and the federal government itself seems to have drawn a distinction between that goal and domestic terrorism. It’s important to emphasize that the Black Panthers and the off-shoot BLA were anti-capitalist, anti-imperialist, anti-sexist, and generally socialist in approach, but they were never labeled a terrorist group. 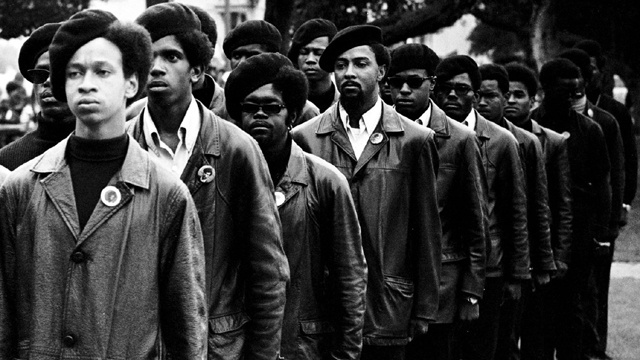 The Black Panthers were diverse. Many branches around the country were into community building like Free Breakfast for Children and anti-poverty programs. There is plenty of literature available on the Black Panthers and its various leaders and members, so there’s really no need here to disprove the idea that they were a terrorist group. Some members, including those who later formed BLA, may have adopted violent methods over the years, blurring the lines between activism/dissidence and terrorism. But, on the whole, the Black Panthers were fighting the socio-political and cultural forces that they believed were stifling African-Americans. According to FBI Special Agent Barbara Woodruff, speaking to the Washington Post, from 1970 to 1984, the BLA pulled off 32 violent armed confrontations, four bombings, and four hijackings in the US. Again, during that time, BLA was never labeled a domestic terrorist group, nor was Shakur. Was Shakur at the scene of the murder? Yes, but she didn’t fire a weapon–that distinction goes to Acoli. Does Shakur’s conviction make her a terrorist? You decide. Or rather, the FBI does. Keep in mind that during the ’70s Shakur and the BLA, as well as many other political activist groups, were surveilled and hounded by COINTELPRO, an FBI program that utilized illegal means and infiltration to disrupt and subvert political organizations. COINTELPRO was known to have used such tactics as false evidence and media reports, unwarranted search and seizure operations, and illegal surveillance, amongst others. Take the case of Black Panther Elmer “Geronimo” Pratt. In 1972, Pratt was tried and convicted for the kidnap and murder of Caroline Olsen. He spent 27 years in jail, but had his conviction vacated by the California Superior Court. Why? Prosecutors kept evidence from the jury that would have led to Pratt’s acquittal. Shakur’s addition to the FBI’s Most Wanted Terrorists list seems like retroactive terrorist labeling, carried out by officials still smarting from Shakur’s escape from prison and justice. Understandable though it is, it comes off as scenery when one considers its implications for political dissidence. It’s a bit like Fox News’ attempt to label Bill Ayers, a former leader of the Weather Underground, a terrorist organization and, by extension, Barack Obama a terrorist sympathizer for working with him in Chicago. Americans, living in a country founded on a movement against tyranny, should turn a more critical eye toward Assata Shakur’s placement on the FBI’s Most Wanted Terrorist list. They should think hard about the ever-expanding definitions of “terrorist” and “terrorism,” and what that means for dissent against the status quo. The halcyon days of easily identifiable Islamic terrorism are over. Welcome to the new machine: In post-9/11 America, all dissidents are potential terrorists. And if one happens to be an activist or political dissident in the United States, one should be prepared for the creative ways in which the government will find a way to label such individuals and groups terrorists. Would King George, were he alive today, have called the American Revolutionaries–everyone from Thomas Paine to George Washington and Thomas Jefferson–“terrorists”? Absolutely.